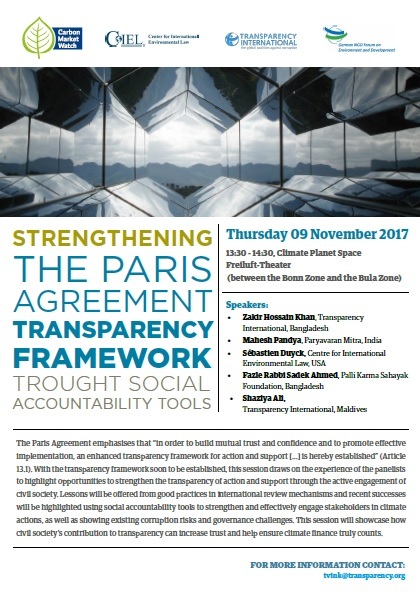 Description: The Paris Agreement emphasises that “in order to build mutual trust and confidence and to promote effective implementation, an enhanced transparency framework for action and support […] is hereby established” (Article 13.1). With the Transparency Framework soon to be established, this session drew on the experience of the panelists to highlight opportunities to strengthen the transparency of action and support through the active engagement of civil society. Lessons were offered from good practices in international review mechanisms and recent successes highlighted using social accountability tools to strengthen and effectively engage stakeholders in climate actions, as well as showing existing corruption risks and governance challenges. This session showcased how civil society’s contribution to transparency can increase trust and help ensure climate finance truly counts.